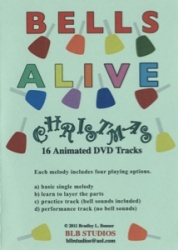 Now beginning handbell players can play along with 4 of their Christmas favorites. Songs include The First Noel, Carol Of The Bells, In Excelsis Deo and Handel's Theme: Joy. Uses RB107 or RB108 bells. By Brad Bonner & BLB Sudios. Playing Time 60 min.